Our free Critical-Mass Blogging Teams got several upgrades yesterday, designed to increase activity and interaction between Team members. Critical-Mass Blogging Teams offer bloggers a way to connect with like-minded bloggers and build relationships that naturally strengthen credibility, drive traffic, and aid content creation. There is no cost for the service. Critical Mass Blogging Teams are teams of like-minded bloggers who promote each others' blogs by sharing each others' posts via social media and "Riffing" on them periodically. It's free to participate. The Critical Mass Blogging Teams section of our website is evolving. Last night, I added the ability to post comments on each team's page using Facebook's comments plugin. 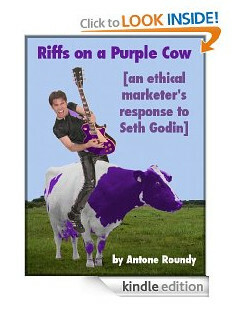 For the next 5 days, you can download a free copy of my new Kindle book, "Riffs on a Purple Cow: a Collection of Articles Inspired by Seth Godin" from Amazon.com. If you don't have a Kindle, get a free Kindle reader app for your computer, tablet, or smartphone here. If you've been feeling like your blog is an island (the isolated kind -- not a tropical island paradise full of tourists), I'd like to help you break out of the isolation. I've just launched a new section of my website, Critical Mass Blogging Teams. So, you've resolved to blog 5 times a week this year. Or 3. Or 1. Whatever frequency you've chosen, odds are you'll need something more than just a new years resolution if you're going to succeed. Over at BlogRiffers.com, I just announced the winner of the first Riff-On Blog Riffing contest. The first BlogRiffers.com "Riff-On" contest has begun. Check out that link for full details. Enter by writing a blog post based on one I selected from Seth Godin's blog, and tweeting a link to it. You have just under two days to submit your entry. I'll pick an article from somebody's blog for the contestants to Riff on. I just finished posting a new video to YouTube showing how teams of all sizes can work together to do high volume content curation or Blog Riffing using SEO Content Factory. The video shows how to make adjustments as you grow your team to produce more content.